Slim, lightweight, powerful, the fully-rugged handheld Panasonic Toughpad FZ-N1 is the all-in-one tool you've been waiting for. 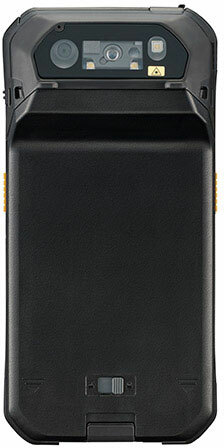 With a quad-core processor, angled rear-facing barcode scanner, warm-swappable battery, and multi-carrier 4G LTE, with voice capabilities, it's ready to go when and where work takes you today. When a flexible device is in demand, the Panasonic FZ-N1 delivers the Android Lollipop operating system, giving you the ability to develop in an open environment with thousands of enterprise grade applications at your fingertips. And it's built to take a six-foot drop or a downpour, so it even works with a wet screen or with gloves on. It is the right choice for unrelenting conditions. Android 5.1.1, Qualcomm Snapdragon MSM8974AB 2.3GHz Quad Core, 4.7" HD 10-pt Gloved Multi-touch, 2GB, 16GB, Wi-Fi a/b/g/n/ac, Bluetooth, Webcam, 8MP Camera, 2D Bar Laser (SE4750), No Drive, Toughbook Preferred. Interface Cables, Power supply, and Charging Cradle Sold Separately. (Part# FZ-VEBN111U) Single slot charging desktop cradle (Part# CF-AA6373AM). Panasonic 4-Bay Cradle With 110W Power supply and AC Cord (Part# FZ-VEBN121M). 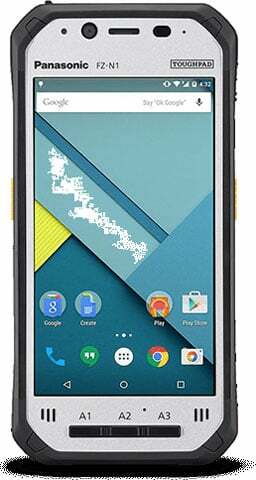 Android 5.1.1, Qualcomm Snapdragon MSM8974AB 2.3GHz Quad Core, 4.7" HD 10-pt Gloved Multi-touch, 2GB, 16GB, Wi-Fi a/b/g/n/ac, Bluetooth, 4G LTE AT & T/Verizon Micro SIM Slots (Voice/Data), Webcam, 8MP Camera, NFC, 2D Bar Laser (SE4750), No Drive, Toughbook Preferred. Interface Cables, Power supply, and Charging Cradle Sold Separately. (Part# FZ-VEBN111U) Single slot charging desktop cradle (Part# CF-AA6373AM). Panasonic 4-Bay Cradle With 110W Power supply and AC Cord (Part# FZ-VEBN121M). Single Bay Desktop I/O Cradle for FZ-N1, FZ-F1 with Built-in Single Battery Charger (No Power supply or AC Cord)* Must order (Part# CF-AA6373AM) separately (60W power supply with three prong AC cord). Vehicle Dock powered. AC adapter not included.